William Charles Arthur Long was born in 1923 in Eastleigh, Hampshire, the older of the two sons of William and Ethel Long. The family would later move to Bournemouth. Long applied to join the RAF around the time of his 18th birthday, but like many young men of his time had to wait several months before eventually being accepted. He was selected for air gunnery training, and qualified in August 1942. He was posted to 106 Squadron in September 1942. He flew on two operations: on 17 October with Sgt Lace on the Le Creusot raid and 8 December, with Flg Off Healey to Turin, before joining Lewis Burpee on 20 December. His first trip with Burpee and his crew was a trip to Duisburg. He thus became the fourth member to join what would eventually become the Dams Raid crew of AJ-S, and would fly on all the 21 further operations flown by Burpee in 106 Squadron, as well as a single trip to Berlin on 16 January with Flt Lt Wellington. Long moved over to 617 Squadron on 29 March, along with all of his colleagues. Like all the Dams Raid mid-upper gunners he had to get used to flying in the unfamiliar position of the front turret, and he was in this position when AJ-S left the ground at 0011 on the morning of Monday 17 May 1943. It was shot down less than two hours later, and everybody on board was killed instantly. 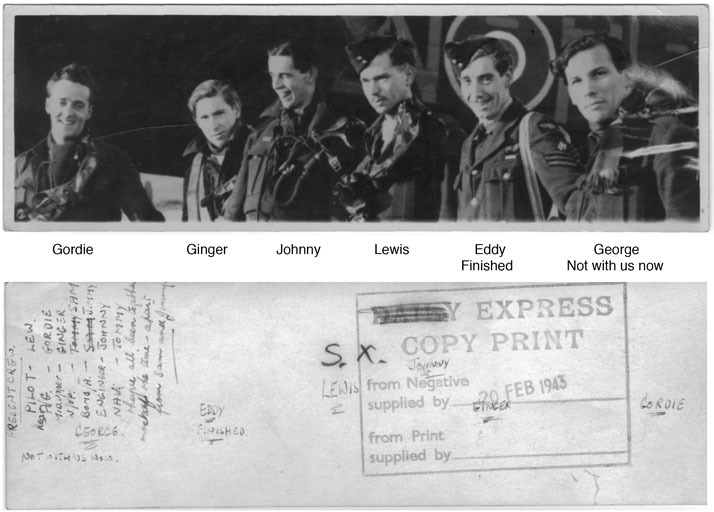 The Germans could not individually identify the bodies of Guy Pegler, Bill Long, Tom Jaye and James Arthur, so they were buried in a communal grave in Zuylen Cemetery, Prinsenhage, next to the individual graves of Lewis Burpee, Gordon Brady and Leonard Weller. After the war the bodies of all seven were exhumed and reburied in Bergen-op-Zoom War Cemetery. Sergeant Bill Long first flew on Operations with 106 Squadron, on 17th October 1942 flying as Rear Gunner with Sgt Lace crew, on the Le Creusot raid. His second operational flight, with the Squadron, was on the 8th December 1942, flying with F/O Healey’s crew as Mid Upper Gunner on the Turin raid. He then ‘teamed up’ with F/Sgt Burpee as the crew’s Mid upper gunner and flew on 23 operational flights with Burpee and one other operation with F/Lt Wellington’s crew to Berlin on 16th Jan 1943. His final operation with 106 Squadron was with Burpee, again as M/Upper gunner, on 12th March 1943 to Essen. He joined 617 Squadron with Burpee, and their first flight was on 31st March 1943, Long was still flying as the crew’s Mid/Upper gunner. He flew on a further 17 training flights as Burpee’s M/U gunner until 29th April 1943, when the arrival of Lancaster AJ-S meant that Long now flew as the front gunner on this the first Air Test flight, and then on further training flights and finally the Dams raid as front gunner. Steve — many thanks for this additional information. The post has been amended accordingly.